The Balti House offer traditional Balti and Tandoori dishes within their relaxed and comfortable restaurant. Wasn't happy with The Balti House when I went a few weeks ago. The menu had the staples you'd expect but nothing inspiring and I wasn't made to feel very welcome. It is cheap in The Balti House but personally I'd rather pay a bit more and go elsewhere. The Balti House is the best Indian in Borough - the staff are great plus they have all the staples and some good specials as well. Everything is delicious but I would recommend the Lamb Tikka to start. 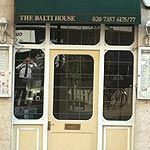 The Balti House have loads of food on their menu and it's excellent value. A very good regular indeed.